The editorials across the world have overwhelmingly called the proposed constitutional changes as disappointing. Though, it is fair to say that almost every one has also found the changes, small as they are, to be a step in the right direction. Opinion from the respected global think-tank, Carnegie Endowment for International Peace, has this take: The constitution King Mohammed VI announced to his country on June 17 has been greeted by Moroccans with a great deal of ambivalence. Although it appears to be a foregone conclusion that a majority of Moroccans will vote “yes” in the referendum announced for July 1, many will do so with reservations. I expect the referendum to be won by the “yes” vote by a considerable margin. Unfortunately I do not think this is a healthy outcome for the country. There is no doubt change will come, but if the “yes” vote prevails, change will take a lot longer and wonderful chance may well be missed. While bringing some improvements, Morocco’s proposed new constitution takes us back to the same institutional structure for the country. 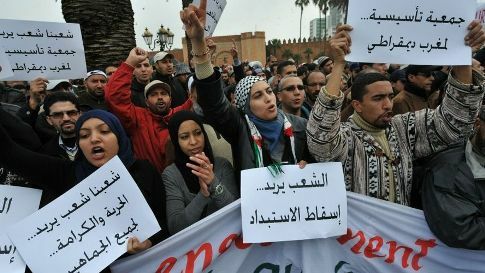 It matches neither Moroccans’ aspirations nor the new regional context. Reform of the constitution has been conducted in an anti-democratic manner, quite unlike what the king, Mohammed VI, claimed in his speech on 17 June. The ad hoc commission tasked with preparing the new constitution was appointed by the king and composed almost entirely of men and women whose loyalty was to him. The palace, deaf and blind, chose to royally ignore the wave of contestation that pushed him to reform and leaned on an aging and subservient political class, which in any case had never asked for change. It ignored the protests of the 20 February movement, which rejected this imposed process and considered that the conditions necessary for the drafting of a democratic constitution were not met. Self-assured and arrogant, the regime stubbornly continued in this vein. This “consultative” approach turned into a farce when the commission refused to allow the heads of political parties to see the draft constitution, finally allowing them only 24 hours to prepare their remarks. This reform has been concocted in secrecy, without real concessions, and under the strict supervision of the king’s political counsellor. These are the facts. The palace followed this approach to its logical conclusion. At the end of the exercise, we were presented with a fait accompli, particularly as the new constitution is being put up for a referendum as a whole and not on a per-article basis. The result is therefore disappointing. It must be acknowledged that the draft presented by the king includes some improvements. The preamble of the constitution, lyrical and replete with homilies, recognises for the first time the diversity – of culture and heritage – of Moroccan society. Amazigh is recognised as an official language, answering a historic demand of the regions of the north. The constitution guarantees in its text a number of rights and freedoms, starting with the right to life and freedom of speech. One cannot but think that the current constitution already guarantees such rights, without really implementing them. There was three days between the speech of King Mohammed VI of Morocco and that of the Syrian president Bashar Al Assad, yet the difference between the two was huge, wrote Othman Mirghani, a columnist with the pan-Arab Asharq al Awsat newspaper. “On the one hand, we’ve listened to a king using the phrase ‘my dear people’ five times as he addressed his nation, describing himself as his people’s ‘first servant’, before announcing concrete and detailed constitutional reforms, expanding the prerogatives of the government and the parliament and promoting the independence of the judiciary. The conditions in these two countries being so different, some might suggest that comparing these speeches is inappropriate. Yet,there are cogent reasons for this comparison. Both leaders came to power around the same time – at the turn of the 21st century – and amid similar fanfare about “new and young leadership” carrying the promise of reform, which both nations needed badly. Until now, if there is any reform process under way, it is happening in Morocco, not Syria. For the record: Morocco has opened over 520 polling stations in its Embassies and Consulates to enable the Moroccans living abroad to vote on the proposed new constitution on July 1. The referendum is open to all the Moroccans abroad who are over 18 and registered in the Kingdom’s Embassies and Consulates. The polling stations will be presided by the Consul or any other official appointed by the Consul or the Ambassador.